Recognized for her ability to establish trust by building genuine relationships, Lisa Lundskow was named vice president in 2016. 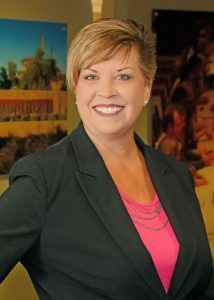 Lisa joined CCMC in 2008 and most recently served as the community manager for Estrella in Goodyear, Arizona, where her talent for connecting people has been proven. While her team’s list of achievements is long, one of its greatest impacts has been in building a cohesive and symbiotic partnership among the City of Goodyear, Newland Communities, Estrella residents and the CCMC team. By doing so, the team was able to gather the funds and volunteers necessary to bring the Vietnam Veterans Moving Wall Memorial to Estrella. This was the first time in history this 24/7 monument was hosted by a community instead of a municipality. Previously, she was the community manager for Vistancia in Peoria, Arizona. Lisa brings more than three decades of professional management to our company. Before joining CCMC, she worked as the community manager for Anthem Country Club. She is a Certified Manager of Community Associations (CMCA) and holds the Association Management Specialist (AMS), Large Scale Manager (LSM) and Professional Community Association Manager (PCAM) designations from Community Associations Institute. She is also a Certified Arizona Association Manager (CAAM) through the Arizona Association of Community Managers, where she serves on the education committee. She is well-equipped to train and develop the next generation of CCMC community managers.